David Boxall, one of our founder Directors, is the first recipient of the Warren-Barnett Innovation Award! David Boxall’s career in the PA industry spans more than 45 years and for the past 35 he has been the ‘Boxall’ in ‘Baldwin Boxall’. Prior to setting up the company with Terry Baldwin in 1982, David was principal electronic design engineer at Millbank Electronics, having started out on his audio career path with Sound Diffusion and germanium transistors. Although perhaps one of the more senior audio engineers in the country, David Boxall is still very much hands on and actively involved with the technical direction of the company. 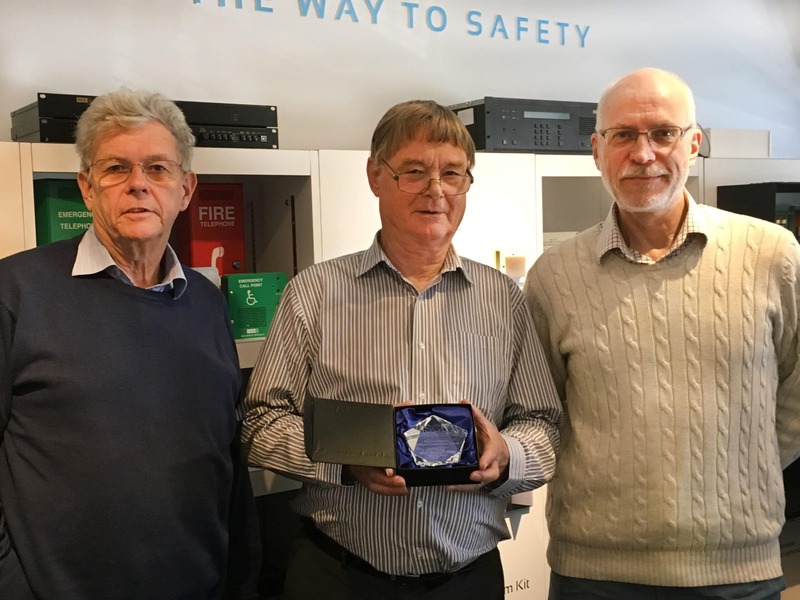 David Boxall, having spent a lifetime dedicated to the technology of the PA industry, was nominated by Peter Mapp to be the ideal first recipient of this new ISCE award. In the photo: (left to right) Peter Mapp (Peter Mapp & Associates, Acoustic Consultant), David Boxall (a founding director of UK manufacturer Baldwin Boxall Communications Ltd) & Doug Edworthy (Principal Consultant, Edworthy Management Consultants.